If you’ve been reading this blog for a while you’ll know that I’m a big fan of Green People – as they are sensitive skin experts I’ve used quite a few products on my boys and I when I came to try the women’s skincare range I found that their products are just as good for me. 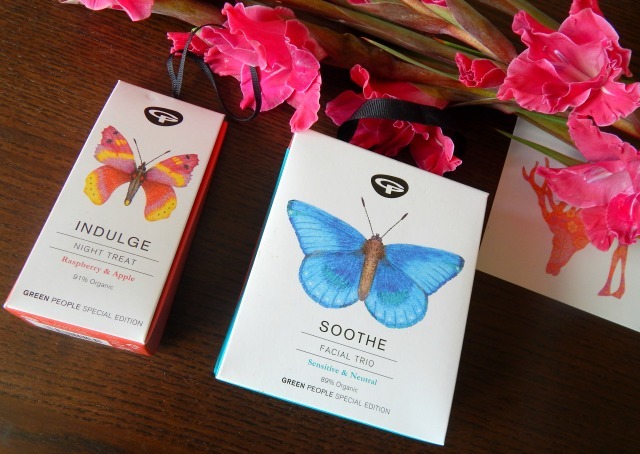 This festive season their new gifting range is supporting the Butterfly Conservation and their gift sets are so beautifully packaged with with hand drawn butterfly designs. As always you be assured that there are no nasties in their products and each one has the percentage of organic ingredients clear on the front of the packaging. If you’re going for natural and organic gifts this Christmas their new gift sets are well worth looking at. There is a whole range for men and women, including hair and bodycare but I’ve been sent two of their lovely skincare sets to try out. The Soothe Facial Trio contains a Cleanser, Moisturiser and Face Serum – all are 30ml and I think they’d make a lovely gift if you wanted to introduce someone the the Green People range. The moisturiser is made with nourishing avocado and protective green tea, the serum is with calming chamomile and soothing marshmallow and the cleanser is with jojoba and calendula to purify and hydrate. They are all designed for sensitive skin, are scent free and the set is priced at £15.95. The packaging this year is so colourful and I love the way the boxes fold out as you open them. I’ve tried quite a few Green People products and I think the moisturiser in this set is one of my favourites, it feels lightweight and is leaves my skin so soft. Everytime I have used it my skin feels plumper and smooth, I find myself reaching for it each morning. This set contains a cleansing lotion which is lovely as it doesn’t feel harsh on my skin and I’m even able to use it on my eyes using a cotton pad. The serum finishes off the set nicely and I find that it makes a wonderful base for my BB Cream. As I have fairly dry skin I find this sensitive range perfect for me as it all feels like it smooths my skin. All three of these products make a great starter for a skincare routine. The Indulge Night Treat gift set contains a Rasberry & Apple Nighcream (30ml) and is priced at £8.50 which makes it a perfect secret santa gift. These are tree-hanging gifts which I think is a really sweet idea as they come with a little loop on top so you can add it to the tree! Green People pride themselves on using quality ingredients and always say ‘a little goes a long way’. I have always found this to be true when using their products but especially with this night cream which is thick and luxurious. I love the scent; it is quite subtle but smells lovely and sweet as you put it on. I always expect good things from Green People and this years gift sets don’t disappoint. You can view the full range on their website. I was kindly sent these gift sets for the purpose of this review. All words and thoughts are always my own. These look lovely and sound really good. Its always this time of year I’m always looking for new moisturisers around this time! Their moisturisers really are lovely, I’m always impressed with them!